The Bookfair is entirely volunteer-run and helping out is a great way to get involved and meet new people. If you're interested, please read the volunteer descriptions, our collective principles and accessibility statements on our website and let us know how you'd like to help out! We are pleased to announce the eighth annual Victoria Anarchist Bookfair, located on unceded Coast Salish Territory in Victoria, British Columbia. The Bookfair is for anarchists and non-anarchists, with participants from all over North America and beyond. Events include book and information tables, workshops, readings, films, presentations, and much more! The Bookfair always includes workshops on a wide range of topics. We seek to introduce anarchism to the public, foster dialogue between various political traditions, and create radical, inclusive, and anti-oppressive spaces. Participants with different visions, practices, and traditions are welcome. Our theme this year is Eco-Defense. We aim to highlight various environmental threats and the resistance movements that have formed against them. From logging of old growth to oil development to mining, we will analyze resource-extraction from an anti-capitalist and anti-colonial perspective. We will explore how the Indigenous and settler populations can share responsibility for the challenges at hand. We aim to move beyond critique and chart creative paths toward healing the planet. As part of Anarchy 101, we require presenters on anarchist history and associated radical theories. We also aim to provide a mix of workshops that show the breadth of issues and the diversity of opinion within anarchism. Thus, we are seeking presentations on topics of colonialism, decolonization, gender, sexuality, 'race', disability, food security, spirituality, feminism, class struggles, poverty and homelessness, animal liberation, primitivism, DIY, militancy, pacifism, anarchism in practice — as well as topics that connect any number of these. Whether it's a practice-presentation, participatory demonstration, panel discussion, facilitated discussion, and everything in between — if you have an idea for a workshop, we want to hear about it! Please consult our Statement of Principles before sending your proposal. This year's deadline has been extended to July 31st, 2013. The heart of the Bookfair is the main room including booksellers, distributors, independent presses and activist groups from all over BC, North America, and abroad. If you’d like to table this year, please provide a short description of your group and the materials you intend to distribute at the Bookfair. There is no fee for tabling at the Bookfair, but we will be requesting 10% of sales after expenses in order to help us cover the costs of the venue rental. The deadline to request a table is July 31, 2013 (we cannot guarantee inclusion on the poster or in our program-zine for late submissions). The Bookfair organizing collective is currently seeking workshop and presentation proposals. They may be aimed at people who are curious about, or new to anarchist ideas and radical practices, or they might address a topic in some depth intended for people who are already familiar with the anarchist tradition, radical activism, or anti-oppressive practices. Standard Bookfair workshops last for 50 minutes with a 10-minute break in between. While we are open to a variety of workshop formats, and we recommend that facilitators leave at least 20 minutes for discussion at the end of their presentations. Each year we get a lot of submissions, but if we don’t have space at the Bookfair, we still want to help make your workshop happen! Please provide a title, and short description of the workshop's content in your submission. If your workshop is accepted, this information will be reprinted in the program zine. NOTE: The deadline for all workshop and presentation proposals is July 31, 2013 (after that date we cannot guarantee a timeslot at the Bookfair or inclusion in our program-zine for late submissions). 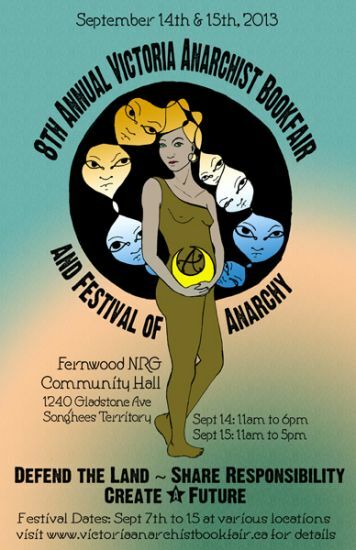 In addition to the Bookfair, a "Festival of Anarchy" will take place during the preceding week, with diverse anarchist-themed events occurring at different venues in Victoria. You can propose any type of event or activity: the only limit is your imagination. Festival of Anarchy events are organized autonomously from the Bookfair and, as such, venues are the responsibility of Event Organizers—that’s you! The Bookfair collective acts as a hub to promote and coordinate these events. We’re committed to helping promote autonomous festival events to the best of our ability through the program zine and the website. If you’re interested in having us promote your event, please provide a title and short description of your program by July 31, 2013 so that we can include it in our zine and on our website. We strongly recommend Festival Events are NOT scheduled during the Bookfair's operating hours. In general, contacting the Bookfair Collective about scheduling dates before our proposal deadline is a useful way to ensure the least number of event conflicts. Victoria Street Newz is looking for articles on anarchism for its September issue. This special issue celebrates the annual Victoria Anarchist Bookfair which takes place the 2nd weekend of September (Sept 14th/15th). This year's poster is by Kelly Rose Pflug-Back. Kelly's fiction, poetry and essays have recently appeared in This Magazine, Counterpunch, Ideomancer Speculative Fiction and Goblin Fruit, as well as anthologies such as The Moment of Change, The Monster Book for Girls and Imaginarium 2012. Her first book, The Burning Streets, is forthcoming from Strangers In a Tangled Wilderness. She is an undergrad student in the Human Rights and Human Diversity program at Wilfred Laurier University and contributing editor for Fifth Estate Magazine, America's longest running anti-authoritarian publication.